Heeft u een vraag voor Floating Hotel? Gelegen in Stadscentrum / Rivierzijde is Floating Hotel de perfecte keuze voor reizigers die Chau Doc (An Giang) en omgeving willen bekijken. Op slechts 10.4 km gelegen vanaf het stadscentrum en van het vliegveld, trekt dit 1-sterren hotel jaarlijks vele reizigers. Ook gemakkelijk te bereiken zijn Chau Giang Moskee, Chau Phu Tempel, Mekong Tours. De faciliteiten en diensten, geboden door het Floating Hotel, garanderen een plezierig verblijf voor gasten. De topfaciliteiten van het hotel omvatten wi-fi in openbare ruimtes, parkeerplaats, roomservice, restaurant, tours. 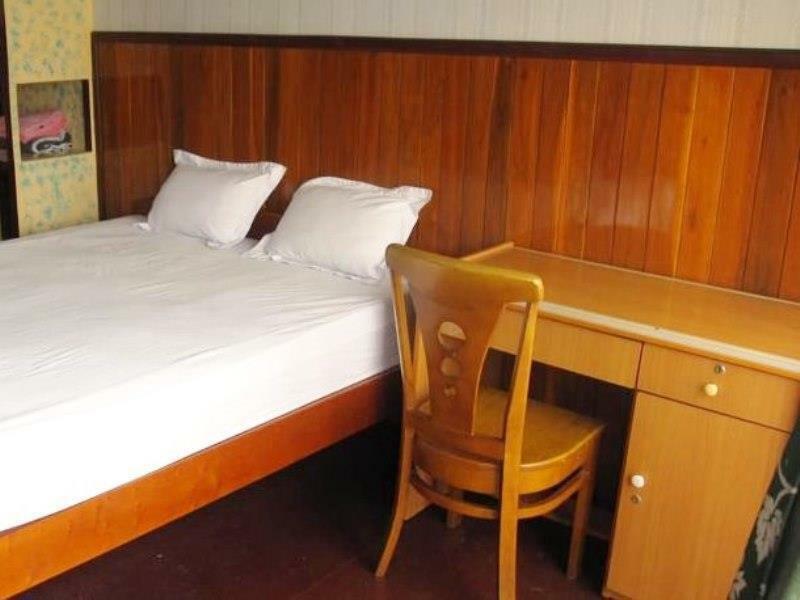 Het hotel heeft 20 prachtig ingerichte kamers voor gasten, elk met internet (draadloos), draadloos internet (gratis), airconditioning, bureau, minibar. Daarnaast garanderen de talrijke recreatieve mogelijkheden dat u zich tijdens uw verblijf kunt vermaken in het hotel. Wat de reden van uw bezoek aan Chau Doc (An Giang) ook is, het Floating Hotel is de perfecte keuze voor een enerverende vakantie. If you're after an authentic river experience this is the place. If you're squeamish about cleanliness, rats, and a less than ideal staff don't stay there. I'm glad I stayed but know what to expect if you do. If you can find it. It's right where I got off the boat but there is no sign and I walked all over looking for it. Closeness to the water, a great deck for swigging beer and watching all manner of boats going past, reasonable meals stairs. We thought we were in paradise when we went out on to our deck and felt we were almost a part of the river traffic. On the down side the beds were hard and the pillows lumpy and the blanket was too small for one person let alone two. We stayed an extra night just to experience the river some more. Apparently there are major renovations happening and if this is the case, it would be a magic stop over. Maybe not as cheaply done as it is now. The overhead restaurant was a bit noisy but the promised disco didn't eventuate either night (Fri and sat). A restaurant upstairs was good as there weren't many western-friendly places to eat in the vicinity. It was also convenient that our boat from Phnom Penh dropped us off there and our tour to Saigon left from there. We are 2 single women who traveled by speed boat and the hotel was delightful. It gives the impression of being on a riverboat and drinks on our private balcony finished the night beautifully. The room is very big and has a nice balcony. For the price it is pretty good value. We stayed here during a weekend and there is terrible karaoke going on in the restaurant or cafe or whatever that is. The electric guitar was so loud we actually had to leave the room to go somewhere else. Thank god the restaurant closes at 10pm, so at least the night was okay. 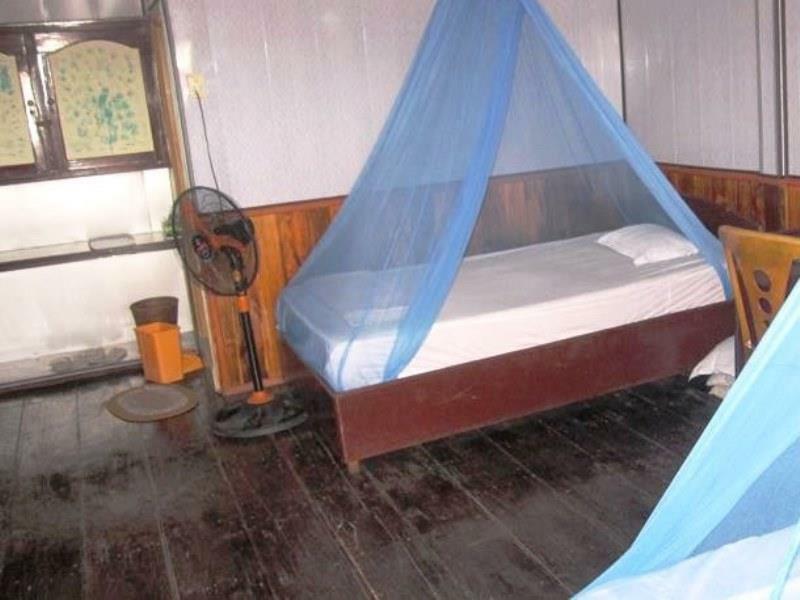 The first room we got had dirty sheets and holes in the mosquito net, so we switched rooms and the second one was better, even though there was sticky stuff on all surfaces, for example the desk. 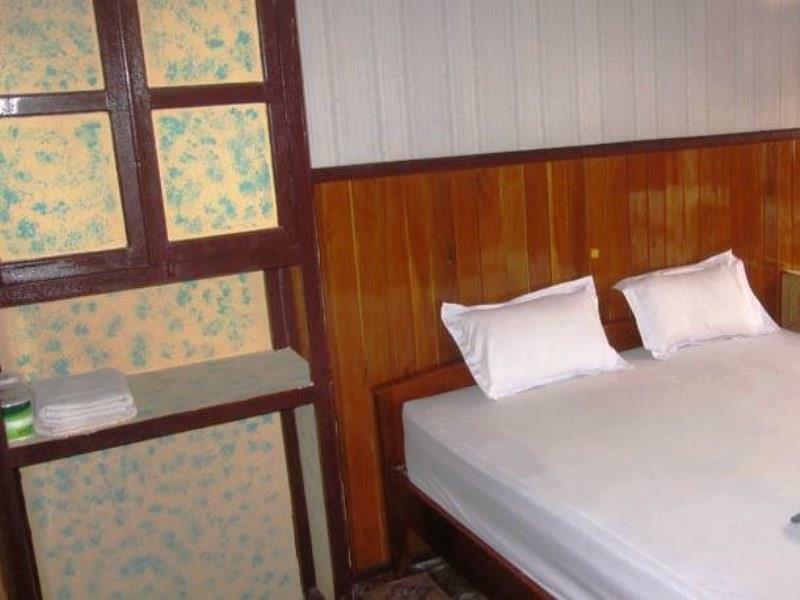 I was not a big fan of the bed (pretty hard and uncomfortable), but the room is cheap and I guess the comfort matches what you can expect from a 1-star hotel. The hotel is a bit worn out but room was clean. There were only 2 other guests so it was quiet. There is a restaurant above the rooms so some stomping can be heard until 10pm, it was not too bad though. As it is on the river there are lots of boats going by and it is nice to watch them. This isn't a luxury hotel for hi-so travellers, but I really like the place. It's exotic, right on the busy, working Mekong River. Lots of very open views; nothing like dining while watching one of the most important rivers in the world go by. Passable pool table in the lounge. Rooms are basic, but comfortable. Staff a mixed bag, some very helpful, some not so much. Cheap beer, more than one lock on the door, life jackets. My stay here was the only place I had to make notes on just so I could remember how bad it was. 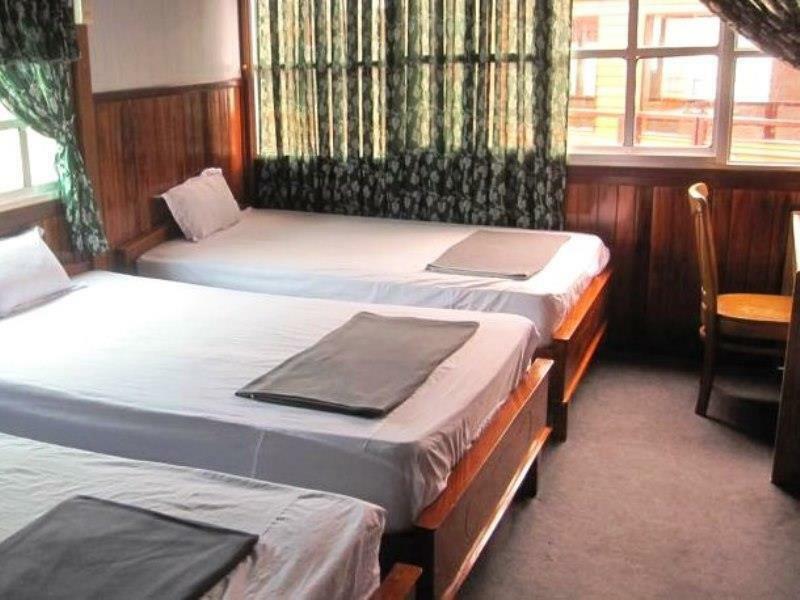 It was the worst place we stayed in the whole of the delta. We were shown to the 'quiet room' which consisted of: Thread bare towels. Springs sticking out of the mattress. The boat next to our room was a workshop that started using hammers, drills and electric saws from 7:15am. We were woken severalties during the night to a 'creature scurrying around - it ran when I got out of bed or if I shone a torch around the room. (We expected coach roaches but not, what we believed to be, a rat.) People knocking on our door at 7am for no reason. People using keys trying to enter our room between 7am-8:30am Poor lighting in the room and bathroom. You can't see your face in the bathroom mirror it is that dark. The hot water shower was only hot for one of my showers over the 3 days I was there. Some of the tour operators staff members could only speak Vietnamese - This is not usually an issue for me but this operator is huge and caters for travellers across at least 2 countries. One of the non-English speaking staff members wrongly accused me of taking my change twice. It was 50,000 dong change from something that cost over 1m dong so hardly a big crime if it was true which it wasn't. In fact I had to ask for my change as she kept it! There is a karaoke boat that sails up and down the river passed this hotel often. The noise is as loud as a rock concert without of the quality singing of one. This went on until way passed 1am. And it moored in front of our room. On the plus side - the beer was only 11,000d. Something you need to drink loads of just to get some sleep. My first choice place to stay was full - hardly surprised now that this one wasn't. I would never return to this place again. The room is very basic and doesn't deserve "deluxe" at all and is too expensive for what it is. Be prepared to fight moskitos and other insects yourself. A big plus is the terrace overlooking the river where you can hang out watching all kinds of transport passing by. The restaurant above the rooms stays open until 10 pm, so the noise levels in the rooms is really high, but after 10 quiet. The bathroom turns out better than it looks: the shower is really hot! The lady from deltatouradventures is very helpful and speaks great English. It's an ok option for Chau Doc as there is not a big choice. first night was on the barge with the bar/ restaurant and it was very noisy, also the rooms were dirty and full off mosquitoes. the second night was better in the residence side, but as usual with thin walls, bugs and backpackers .... no sleep. nichts für hohe ansprüche aber super zimmer (sauber) direkt auf dem mekong, freundliches personal, restaurant schließt um punkt 22:00 uhr dann wirds leise. würden wieder kommen! !achtung hotel hat keinen vertrag mehr mit agoda! Un vieil hôtel dans son jus, simple et rustique. Mais avec une vue magnifique depuis la chambre, dotée d'un balcon sur le Mékong, qui fait vite oublier le côté spartiate de l'endroit si on le souhaite. Personnel accueillant. Draps propres. Bien situé par rapport au centre ville.